There is a cool Civil War ipad app written about in this Tech Crunch posting. I think this would be super to have for the Rev War. Please let me know if you would like to work on this with me. OK, we just did a soft launch of the new website and already discovered an error. The panorama identifying cannons as Knox’s Cannons is in fact incorrect. As indicated on this page, the cannons are those left behind by the British at Fort Independence. There’s only two of us working on this, so please be patient and we’ll make the correction after July 4 when we return from vacation. This past Sunday, April 3 was the rehearsal of the Battle of Lexington. Jeff Engel and I went to the Lexington, Massachusetts, Battle Green, to shoot some video of the event and to make a promotional video of myself introducing the Virtual American Revolution project. After several takes of me fumbling with my words, Jeff was able to video capture something decent. I used iMovie on my iMac to make the video clip. I apologize for the amateurish look but I’m a professional virtual tour photographer, not videographer, lol. Every year, the re-enactors try different things to make it a little bit of fun for themselves so there is typically an element of humor. You’ll see it in the right foreground in the video shown. 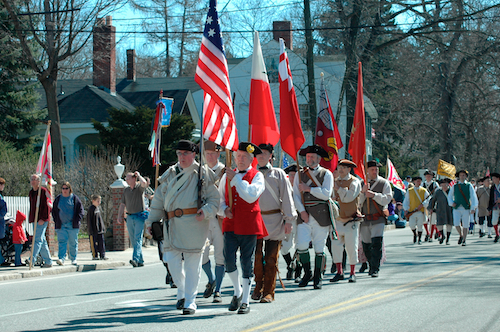 The actual re-enactment takes place on Patriots Day at 6 am. Here is a link to the events at Battle Road.